Sometimes when I see fabric it screams to me “I AM A PENCIL SKIRT/WIGGLE DRESS/BLOUSE” and sometimes it is silent, holding its mysteries quietly. Regardless, once it’s made up I often can’t imagine how anyone else in the whole world could have made anything else out of the same fabric – obviously it was that and only that all along! So wouldn’t it be wonderful to see that fabric made up in lots of the possibilities? Earlier this year members of the WSBN were talking about this and we agreed that it’d be cool to all make things from the same fabric to see the other personalities lurking inside it. Although it was a great idea, trying to find a fabric that we all liked seemed impossible so it was shelved. Then, Kat of Modern Vintage Cupcakes did a “swap your stash” series and featured Juliet of The Crazy Gypsy Chronicle’s stash, which included a green self-striped silk/cotton lightweight fabric. I piped up in the comments to say that I also had that fabric in my stash! And then someone else commented that they liked it too. And I knew that someone else had it as well. With it already appearing in so many people’s stash (helped by it’s ridiculously good price no doubt) we settled on that for our matching mission. Other willing participants ran out to buy the fabric, and we promptly cleaned Global-that-was out completely of their stock, with 10 of us all lined up to make matching garments. Needing a great name, we settled on “What’s the deal with all the teal? The ultimate matchy matchy mission”, but, to be honest, I don’t think it’s teal. But rhyming is IMPORTANT, guys. Anyway, although this all happened in February, we decided to give ourselves some time to plan and acquire patterns, and then due to the weight of the fabric we decided it was a springtime thing and chose September to have our meet-up and grand reveals! Lots of time would mean that everyone would turn up, right? 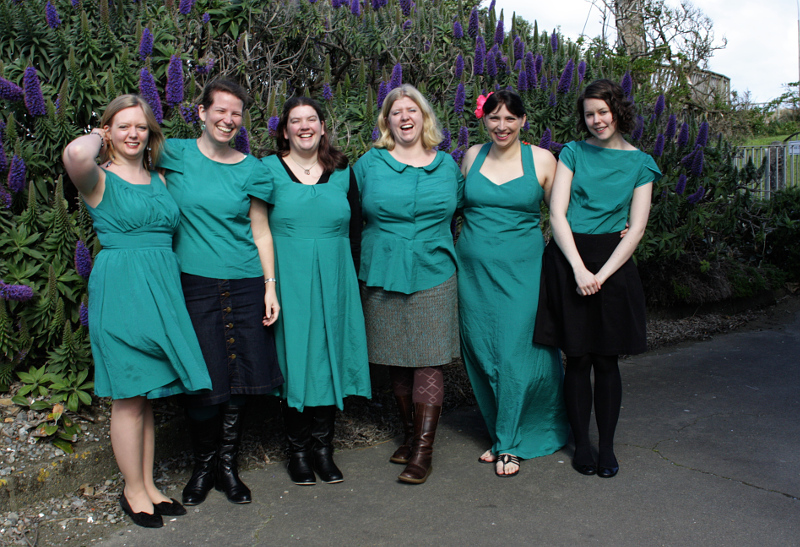 Unfortunately other commitments and illness felled our numbers, so 6 of the 10 of us met up to show off our green makes, but that was still plenty for a great day! 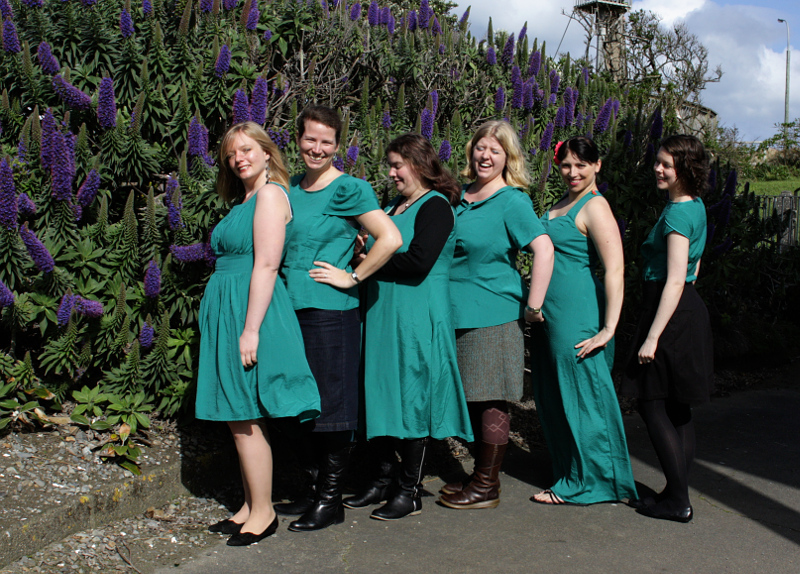 The WSBN can’t meet without food being involved, so we’d originally planned for a picnic to celebrate springtime and our floaty silk/cotton. 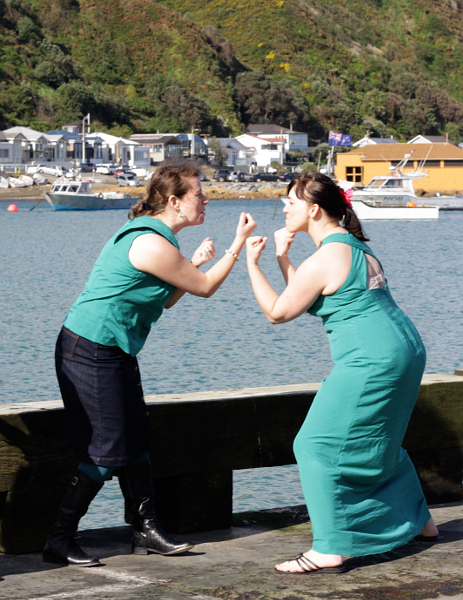 But given Wellington’s notoriously changeable springtime weather the day dawned grim, so we had the “picnic” at my place and then took advantage of the afternoon’s window of warm dry weather to go to the park and the beach by my house for a photo shoot, photos taken by my dear darling friend Sarah. 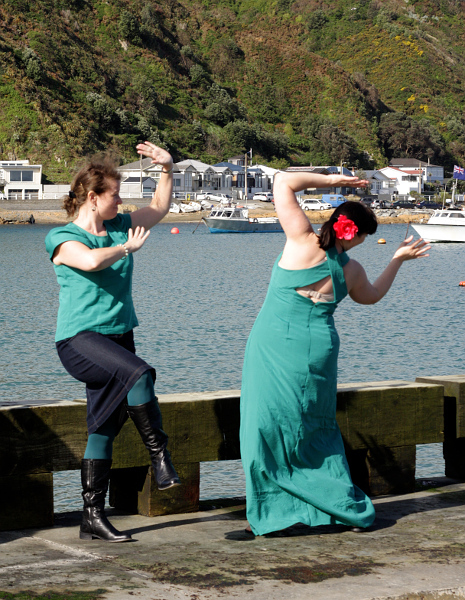 We had so much fun on the day, mucking around and taking silly shots like this. I saw the fabric first! Of course, despite having the better part of six months to do the challenge, we pretty much all left it to the last possible minute! So there were some safety pins and hand tacking and other shortcuts on the day. I was frantically sewing right up until people arrived, and then the darling Sarah (did I mention she’s awesome) did the hand sewing needed to get it to wearable, while I made chocolate mousse (this is important. Mousse is always important. Especially my mousse). 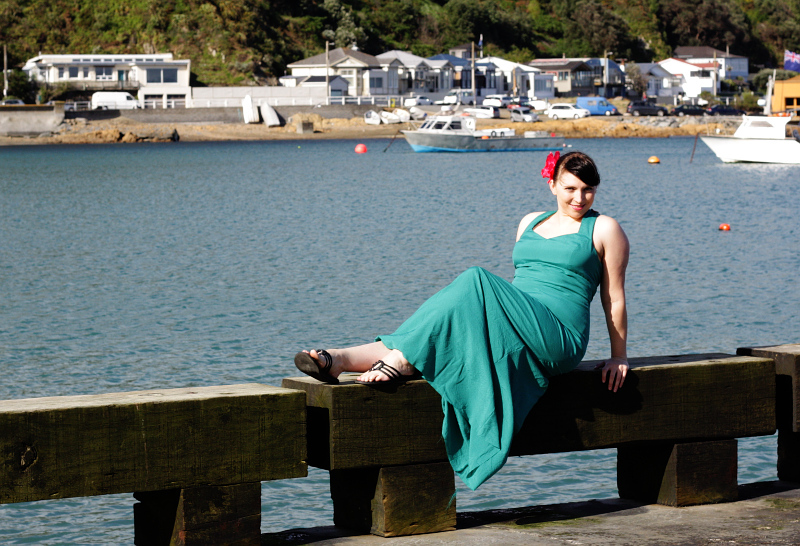 And I didn’t get it hemmed though so it drapes artfully over my feet in these photos! Luckily I wasn’t the only one unhemmed. But despite all the unfinished bits, everyone looked great and we had a fantastic time. These women are awesome! When I was stroking the fabric in store (what, don’t lie, you do it too) it told me it had to be a maxi summer dress, with lots of the floaty goodness billowing around me. When it came time to make it up I contemplated by Hand London’s Anna pattern (which I’ve fallen in love with and will make lots of, but which didn’t exist when I bought my fabric) but the fabric had told me the dress needed to be quite bare on the bodice, with exposed shoulders, open back, and low neck. And well, the fabric knows best! I went through my pattern stash about five times but much to my surprise I couldn’t find anything that met all my criteria other than a vintage patterns about 93 sizes too small. I was frustrated and tried to talk my fabric into other options, but it was stubborn. So I decided to go through my stash one more time, this time pulling out EVERY dress pattern for extra close scruntiy. 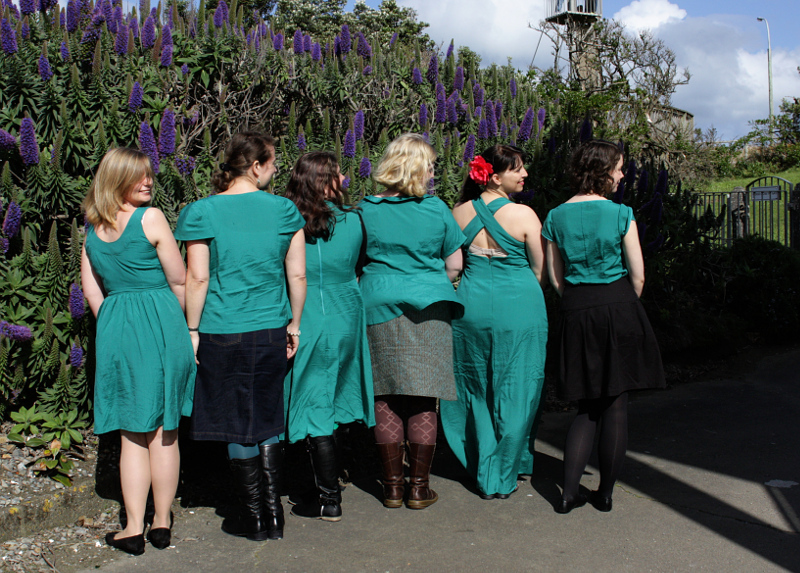 I spotted Butterick 6463 and realised it was perfect! 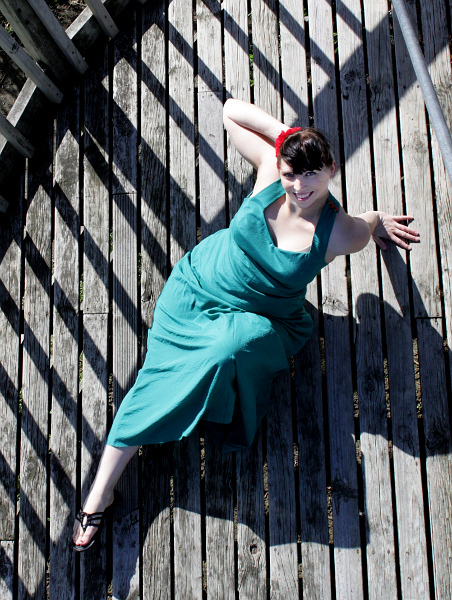 I’d dismissed it the first squillion times as an evening dress, but actually, I realised it had all the features I was looking for and made up in the green lightweight fabric rather than a crepe or satin it would be transformed into the perfect summer dress. The fabric had been right to hold out. Making it up was surprisingly easy. I did my current trick of finding the finished measurements on the tissue and grading between sizes as needed, and then making a toile. My toile revealed that I needed some length taken out of the back straps and a tiny bit shaved off the princess seam to get a great fit, which were easy fixes. I self lined it and the lining went in easily. The pattern called for the whole thing to be lined, but I cut the skirt lining to just on the knee to allow the bottom of the skirt to be floatier and a bit more sheer, to really drive home the “sundress!! !” point. There are buttons and rouleau loops on one shoulder, but after making it up I figured out that I don’t really need them to get iton the dress, so I hand stitched the opening closed. I decided to work with the summer theme and chose cute wee strawberries for the buttons. The buttons sit right on top of the shoulder though so they’re not easily visible, so I’m thinking of putting one in the middle of the neckline too. 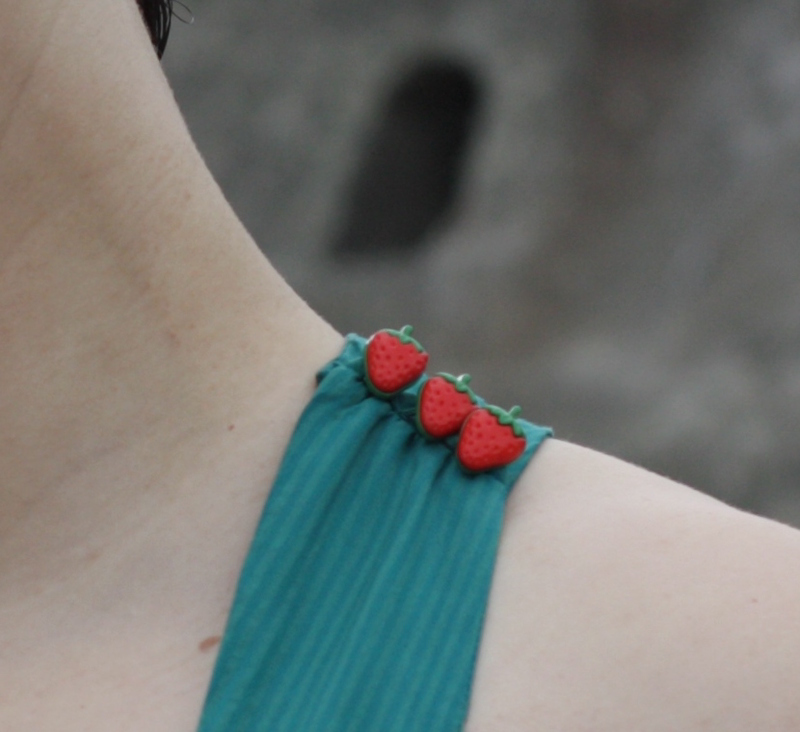 Next time I’d just not bother with the whole shoulder button feature at all and just sew the straps closed on both sides, but I do like knowing the strawberries are there! 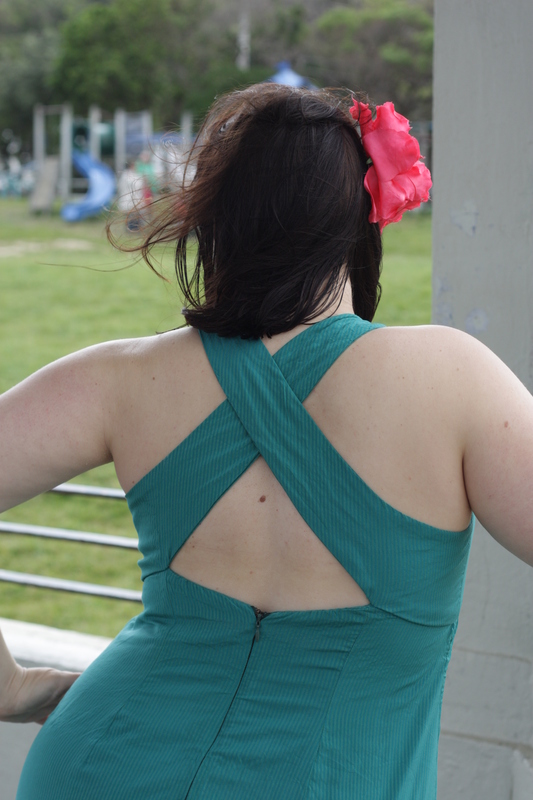 I use MrsC’s taping method (which I LOVE) on the sweetheart neckline and across the back to help stop sagging and gaping, and as always, it worked great. But I didn’t do the best top-of-an-invisible zip insertion ever, unfortunately, as the rest of the zip is great. I narrow hemmed the outer layer with my sewing machine, but I used the rolled hem feature on my overlocker on the lining as a bit of an experiment. My old overlocker had a rolled hem setting but I‘d never used it as I’d never made anything for which it would be suitable. So this was my first time doing this and I love the finish. I can see this cropping up more in the future. …but up close you can see the top of my zipper isn’t the best. Oh well. 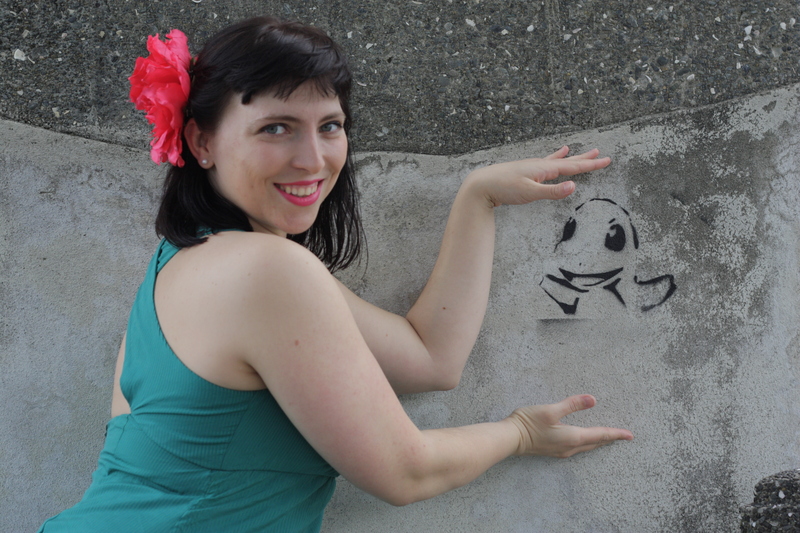 I didn’t get solo photos on our meet-up day as I wanted to wait until I’d hemmed it, so I finally got another set, also taken by dear and darling Sarah. 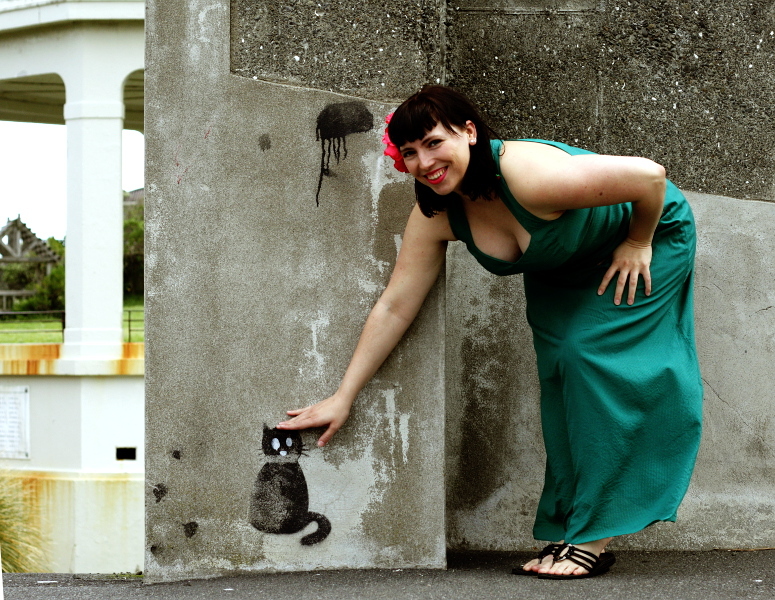 I’m lucky to have such great sewing and photographing friends! It was two fabulous days, and so much fun to see everyone else’s interpretation of their fabric! It was great to see what the same fabric whispers in the ear of different people. I’m going to half to talk to mine again. 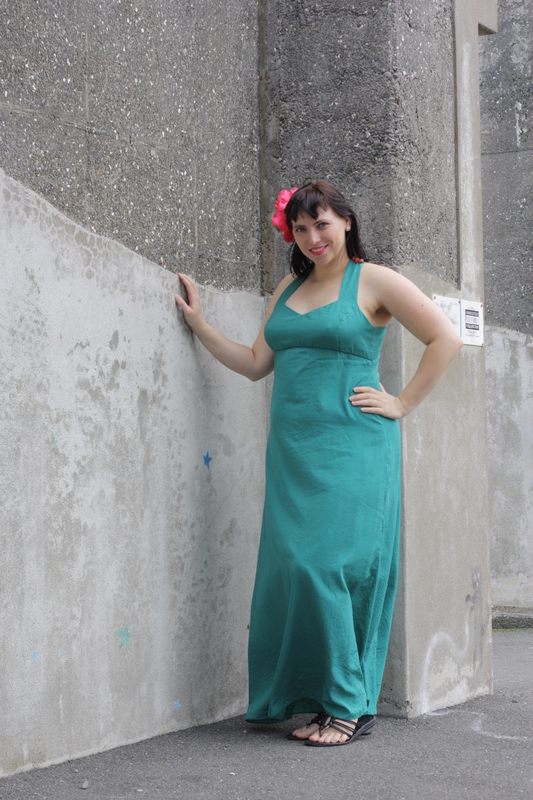 I was so dedicated to the idea of a long floaty dress that I bought about 4 metres, and despite making and half length self lining a full dress I still have nearly a metre left! So a top of some description might show up at some point too. Although, at the moment, my fabric is remaining really quiet about exactly what that top might look like. At least I have lots of inspiration for it though!